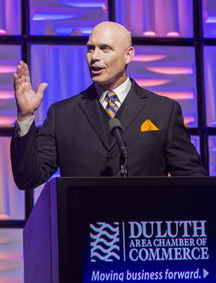 There are seven candidates seeking to become the next great Mayor of Duluth. Additionally, there are fifteen candidates vying to become either Duluth City Councilors or Duluth School District Board Members. These candidates will bring a robust array of new interests, talents and goals to the political debate and to the positions they seek. The candidates who are elected will have a profound influence on how our beloved community moves forward. The Chamber's leadership understands how the relationships we develop with these candidates will be productive - if the relationships are based on trust. Trust will be fostered if we enjoy a free exchange of ideas, an interest in learning the rationale behind opposing positions, and the understanding that we can remain respectful even while disagreeing with each other. We seek to advocate for our members by educating elected officials regarding the challenges that our members face in their quest to operate successful businesses in our beloved community. As elected officials come to better understand the challenges businesses face, and the value businesses bring to our community, they are more likely to made decisions that are sensitive to, and appreciative of, these businesses. Taking the time to understand an elected official's point of view is a powerful means of establishing a trusting and sustainable relationship. On those occasions we cannot agree, we must respectfully disagree with the opposing position. If these trusting relationships are established and maintained, the Chamber will be able to have an influence on decisions made by our elected officials. Ideally, we will be able to do so in an honorable manner. The Chamber's commitment to influencing others with honor should not be mistaken for a lack of conviction. We continue to advocate for our members with all of our energy. We do so because we believe in the positive impact that a healthy business community can have on our Zenith City. We intend to serve as the voice of business well into the future. We go forward realizing that our ability to influence decisions made by our elected officials rests ultimately on the manner with which we conduct ourselves. In his book, The Art of Worldly Wisdom, Baltasar Gracian states emphatically, "The sole advantage of power is that you can do more good." The Chamber intends to continue engaging our 1,100 members, and the resources at their command, to do even more good for our shining city on the hill.